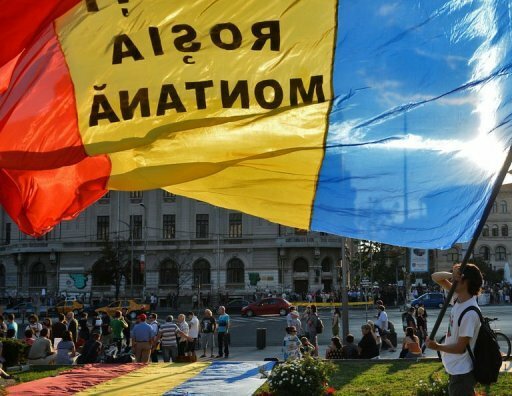 A protester holds a Romanian flag reading “Save Rosia Montana” during the eighth day of demonstrations in Bucharest against a Canadian gold mine project using cyanide,on September 8, 2013. Carrying banners reading “I love nature, not cyanide” and “Corruption equals cyanide,” they called for the resignation of Prime Minister Victor Ponta, whose government last month adopted a bill clearing the way for the open-cast mine. “We are calling on the government to withdraw this draft law without delay,” said Tudor Trif, a 29-year-old engineer marching alongside his wife and son. “We cannot bequeath to our children a lake full of cyanide and a polluted region,” he told AFP, referring to the huge tailings lake where used water from the gold mine will be stored. “It’s the first time that young Romanians rally against a project threatening the environment, I find it quite encouraging,” singer Mihaela Mihai, 66, told AFP. Opponents say the mine will be an ecological time-bomb and threaten the area’s Roman mining galleries. The project will also lead to the destruction of four mountains and require hundreds of familes to be relocated.